Pen and Gravy vs Modernish is a pop-up homeware and design shop in Sydenham and is part of the SEE3 Shop Revolution, part of the Portas Pilot Project. Update - it's now popping up for a further few weeks, following the success of the pre-Christmas run. "London Pop Up homeware and design collaboration Pen & Gravy vs Modernish launched on Saturday 1st December to an overwhelming public response, also featuring in the Evening Standard Home & Property magazine’s Top 5 December events. The Pop Up shop is due to run until Christmas Eve, although discussions are underway to possibly extend this. More details to come. Pen & Gravy is the vision of local self-taught artist Jamie Palmer who brings his original and highly intricate, colourful patterned one-off designs on a range of lampshades and ceramics to Kirkdale in South London. The other half of the duo is Dan Thomas of Modernish – a UK based company which specialises in a curated range of mid-century British and Scandinavian designs in posters, ceramics, paper goods, books and furniture. Also being displayed is a celebration of iconic South London landmarks on prints from local artists. Throughout the rest of December, Jamie and Dan will show you how to customise your own lampshade, plate or create your own original Christmas decorations through workshops and will host a series of special evening events. A special feature of the Pop Up shop is the community art wall which people are invited to contribute their own self portrait doodles to win something special. Anyone who participates will be entered into a random prize draw which will take place on the afternoon of Dec 23rd. There will be mulled wine and mince pies on the day. 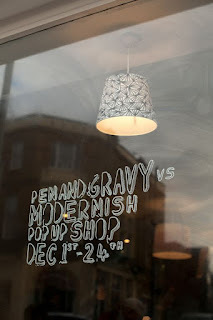 Pen & Gravy vs Modernish collaboration was launched through The Shop Revolution, a high impact project that aims to bring empty units back into use and interest to the high street through the introduction of pop up shops. This project is one of three strands of the South London SEE3 Portas Pilot Project."